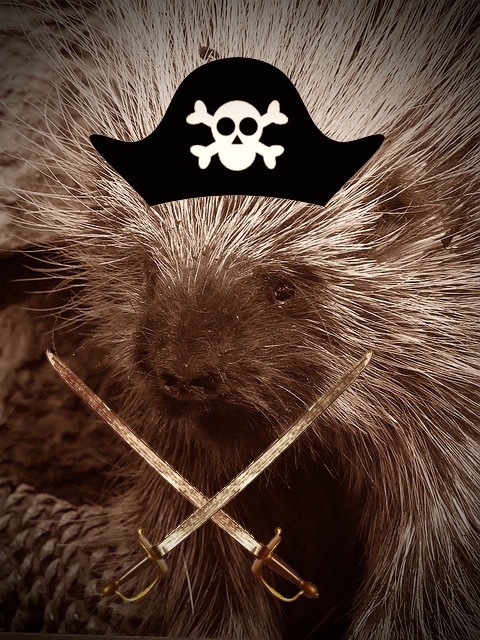 We have a few items of note to address before this, our next episode of Princess Pricklepants and the Perils of Pirate Plunder. First off, sorry if we scared any of you with the brief Princess Evilpants interlude. There was a brief accident involving a malfunction when transporting her from the Huffledome, but things have been sorted out. Princess Evilpants was from a Mysterious Mirror Universe, but the technical glitch was sorted out and our polite Princess has returned. Second off, we haven’t got a second item, so this is just pointless rambling. Please just skip this sentence and the previous one so we can move forward without getting bogged down in a pointless digression that just wastes words and adds nothing of note. With that brief preamble, we begin our story with a picture with words under it. 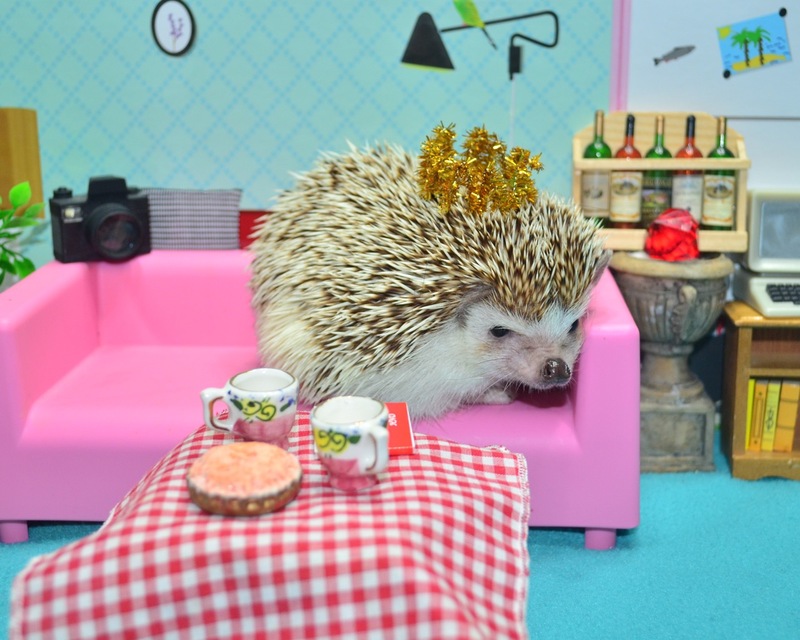 Princess Pricklepants was moderately displeased. The last few elections had all nominated her to serve as night watch on the ship. Democracy sometimes didn’t really seem very polite. This shift was particularly difficult since she had only gotten ten hours of sleep during the day, so she was somewhat tired. Very tired, really. So tired that she drifted into sleep and dreamt a peculiar dream full of mysterious symbolism very relevant to the story even if it’s maybe a little overt. She searched under the couch to see what other crowns might be found and caused even more damage to the set, much to the dismay of the narrator. She decided to save the nice cap, but to continue looking. After some further digging in her surroundings a much nicer crown was found. The crown was nice, but heavy was the crown that sat on her head. It was so heavy it fell off repeatedly which was rather irritating to the narrator (who was also the photographer). The hand servants offered their help, but their assistance seemed to stick out too much for proper regalia, and this solution didn’t see at all suitable for such a noble hedgehog. Princess was frustrated with this, “mysterious mystery” – what kind of diction was that? Yet she realized that the mysterious pirate voice was not really always polite, helpful, or even grammatically correct, so that was all she was likely to get. 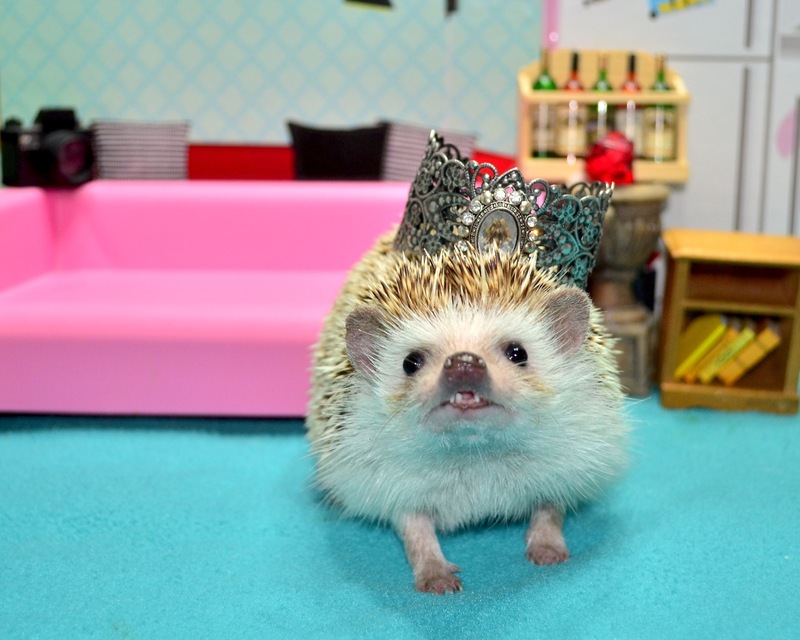 She sought again for a crown suited to a hedgehog of her bearing that was perhaps a bit lighter and more comfortable to wear. With a bit more searching around, she ruined the set once more, but discovered something wonderful, and was very pleased. The hand servants set upon her head the final crown, and it was really quite nice. 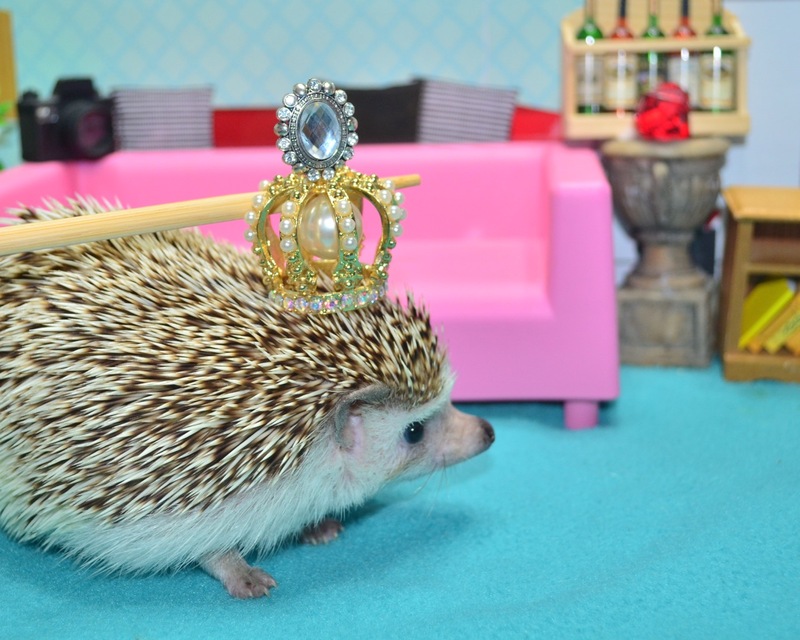 She was delighted, so delighted that she tipped the crown at a jaunty angle which to hedgehogs is symbolic of really liking having things that are set upon them. She was very pleased, and felt happy that she would no longer need to keep looking, since she knew she had found what she had needed. Princess woke up and looked around. The stars in the night sky were lovely. It was a very strange dream, with a very annoyingly heavy crown, and she wished there would have been more digging under furniture, since that was such a delightful thing, but in all seemed like a helpful interlude on their adventure somehow. She remembered the mysterious pirate voice, and knew her quest was making progress. Soon there would be an Island of Mystery with some new trial. 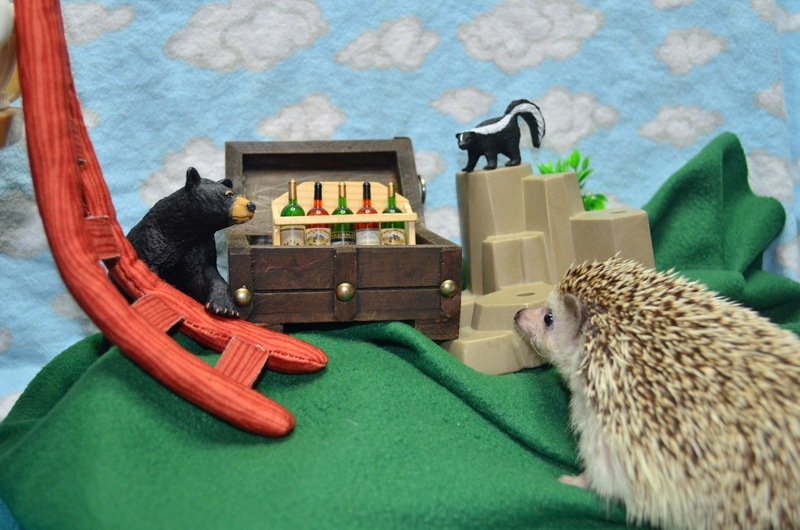 Will they finally find Captain Quillbeard’s mysterious treasure? Will we sort out a better way to make something island-like? What exactly is this mystery of Mystery Island? Is this thing going to wind up being like eight posts long before we can finally finish? These and other questions may be answered in our next episode, Princess Pricklepants and the Perils of Pirate Plunder: Mystery Island (or something similar). A few notable things need to be cleared up before we can begin our most recent episode. Also first, there were a few poor visitors who came here from searches that we really need to address to protect future visitors looking for these things. 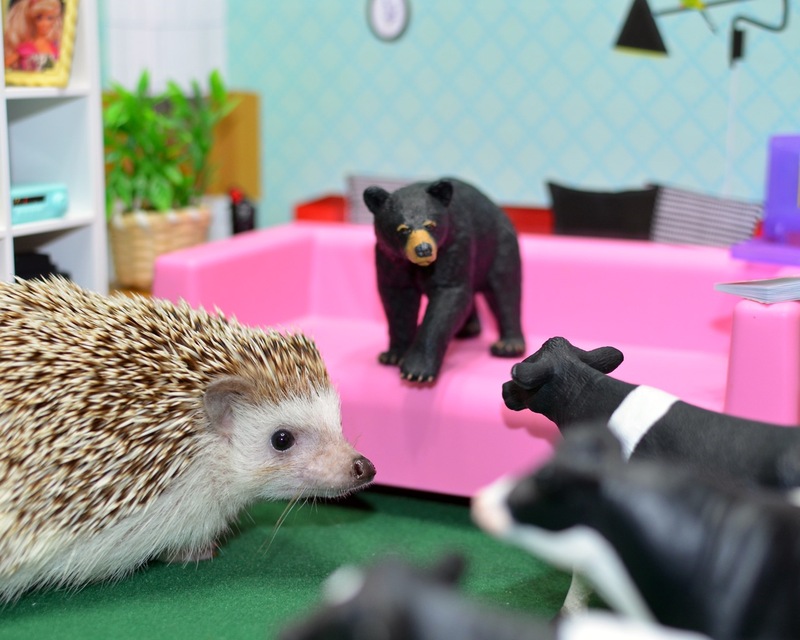 Someone searched for “what does a pedigree hedgehog do its business in.” The answer here is simple, the same place a non-pedigree hedgehog does its business in. Someone searched for “regal san clemente,” which kind of sounds interesting, but um, we’re not a reliable resource for regal san clemente related information of any kind, and are really confused how a search engine though we were relevant, and more confused that someone would see a hedgehog blog and decide that was a reasonable thing to click on to find out more on regal san clemente. But still, it’s nice to have visitors. Someone searched for “peregrinate with me” which is such a compelling little phrase that we had to share it, though we have no advice for our traveling friend. Sadly, they didn’t leave a comment with contact for us to make our travel arrangements so they are stuck peregrinating alone. 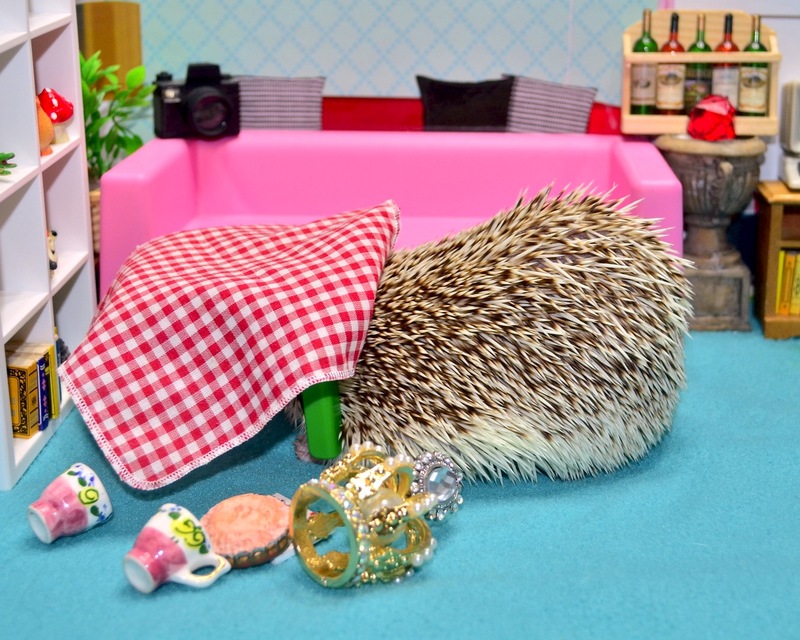 Finally, someone searched for “sleeping in bed with pygmy hedgehog,” a topic we haven’t covered here before. This is one we really need to address to protect any and all who might be so insane as to attempt this. Do not attempt this. It is a terrible, terrible, idea in every sense. You will be intermittently woken up by your night-wandering little stabby pal. Each time you will be awakened perforated in some new terrible way. 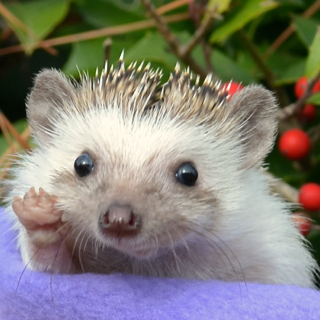 In the morning you will be exhausted and lying in a bed full of hedgehog poop and pee. You don’t want that. 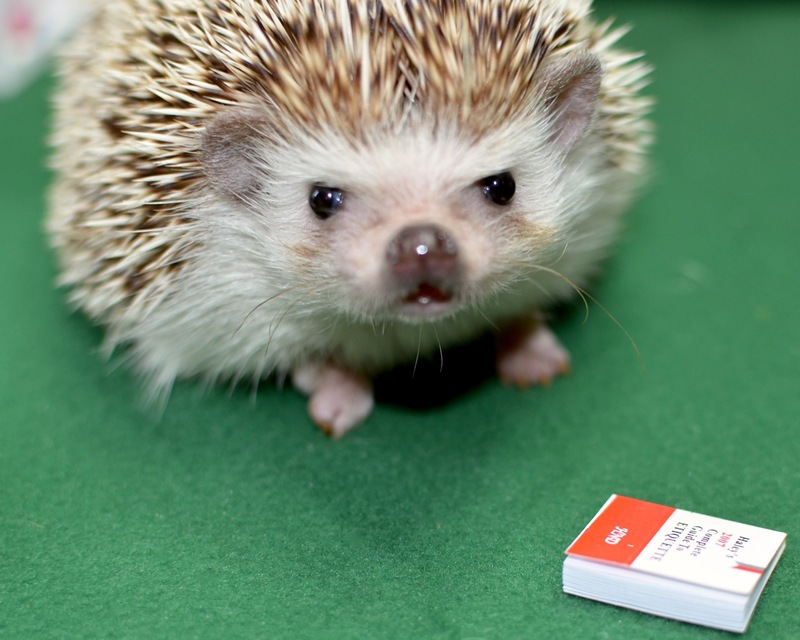 Your hedgehog doesn’t want that. Nobody wants that. Don’t do it. We’ll definitely never try it again. Wow, that’s a lot of preamble. We had a Quentin-related thing, but we’ll share it some other time, were going to note our frustrating chicken problem, and wanted to mention that we’re bumping the word count, but no time for that now. So now we will proceed to our first picture with words under it. 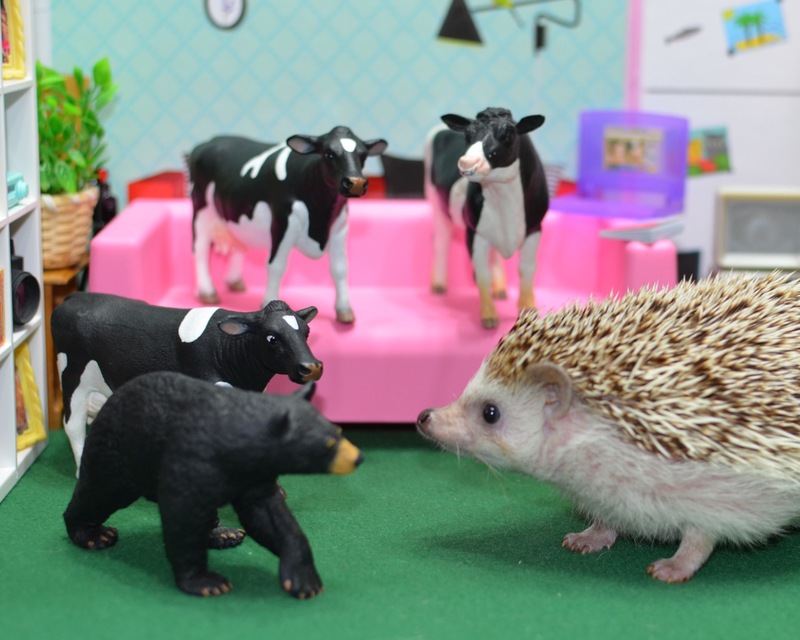 Princess Pricklepants and her intrepid crew carried on gallantly. Their adventures with the art-model cyclops baker left them somewhat shaken, the trip seemed more dangerous than anything they’d done before. 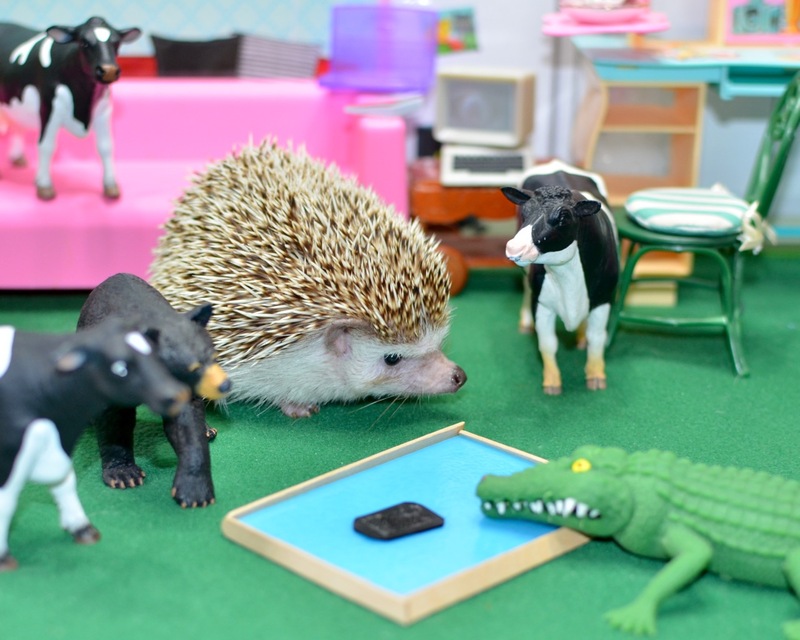 Boris had eaten all the cyclops baker’s pies after a few hours, much to the annoyance of everyone else. 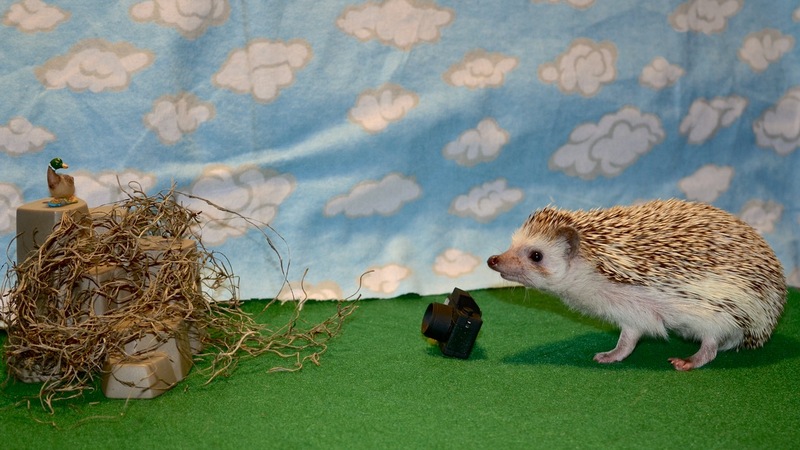 They began their daily Quillbeard Quest meeting. “I’ve really been looking forward to today’s meeting,” said none of them. It was generally decided that someone should probably straighten things up at some point. There was only one vote against. Princess sniffed around. It wasn’t too bad, a little musky, but not incredibly bad. Plus there was a chest like the one pictured on the map just sitting there. She went to investigate. Suddenly the Dread Smellbeast of Terror appeared! Princess bravely attempted her natural defense maneuver. Princess decided to use the power of politeness to defuse the situation. 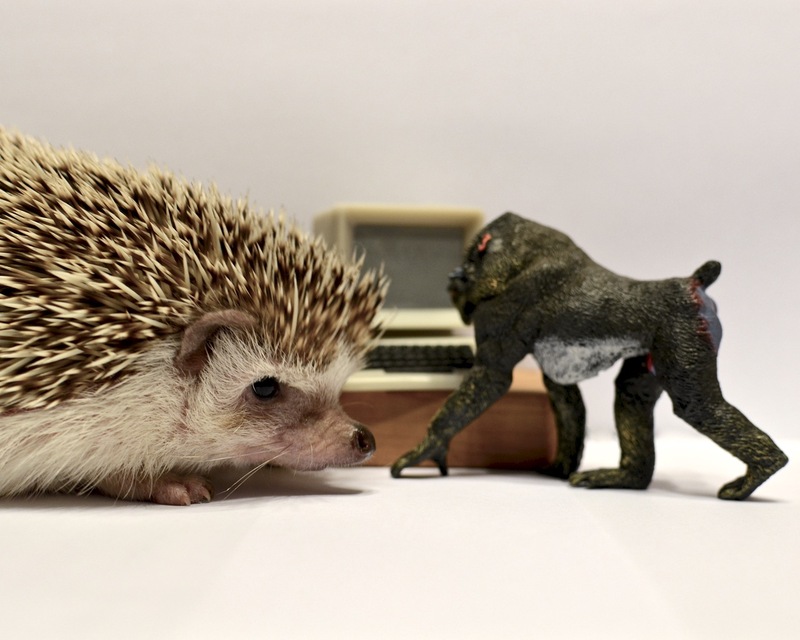 There was more pleasant conversation, and eventually Princess Pricklepants and Franklin (Dread Smellbeast of Terror was more of a nickname) were fast friends through the power of politeness, manners, etiquette, and delightfulness. 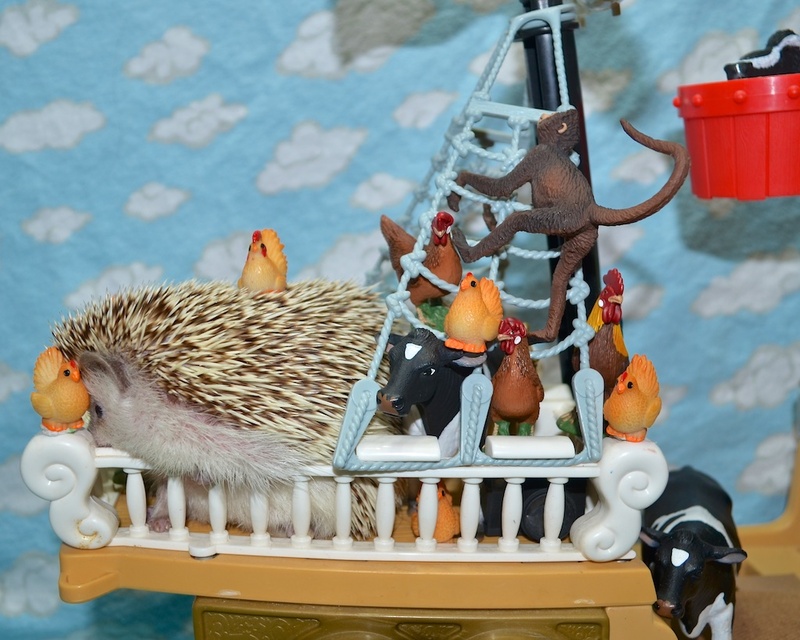 Franklin learned about Captain Quillbeard’s capture and failed swimming experiment, determined that there was no longer a need for the Quillbeard Calling, and agreed to let them open the chest provided he could join them on their adventure. They opened the chest and were somewhat disappointed. There was nothing really interesting, just some bottles of wine. Only the cows were really wine drinkers, and none of them had a corkscrew. But apparently it was important, so they loaded it on board. 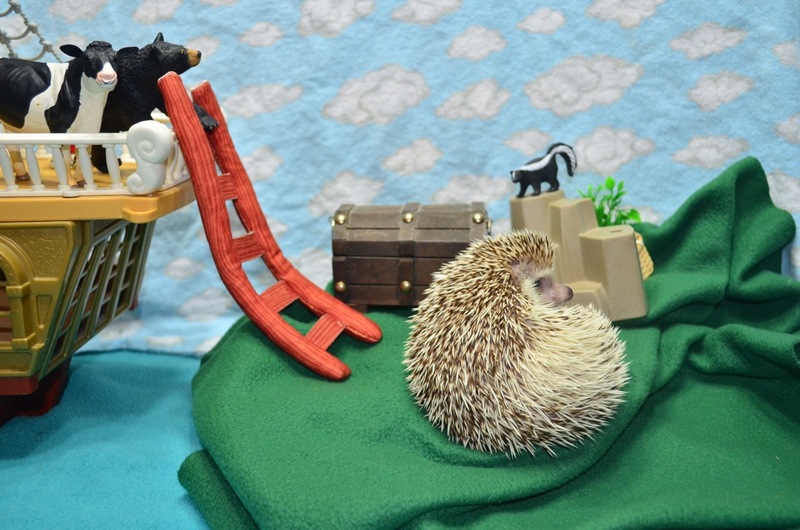 With a suitable place for Harold on the ship, they peregrinated with one another onward towards their next adventure. 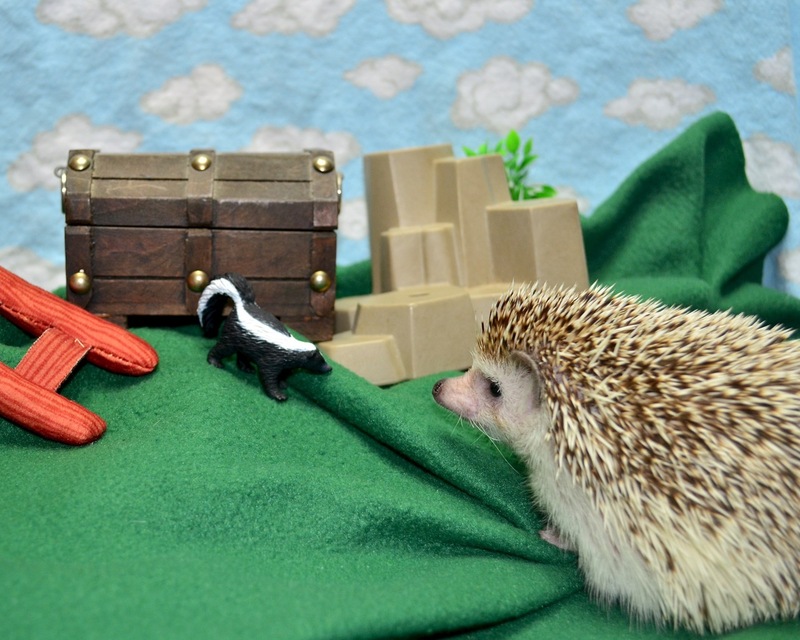 Will they finally find Captain Quillbeard’s mysterious treasure? Will they visit another island while we continue to wait for our package of props to be delivered? Will we sort out a better way to make something island-like? Will we ever iron the sky? These and other questions may be answered in our next episode, Princess Pricklepants and the Perils of Pirate Plunder: Part IV – The Journey Continues (or something similar). 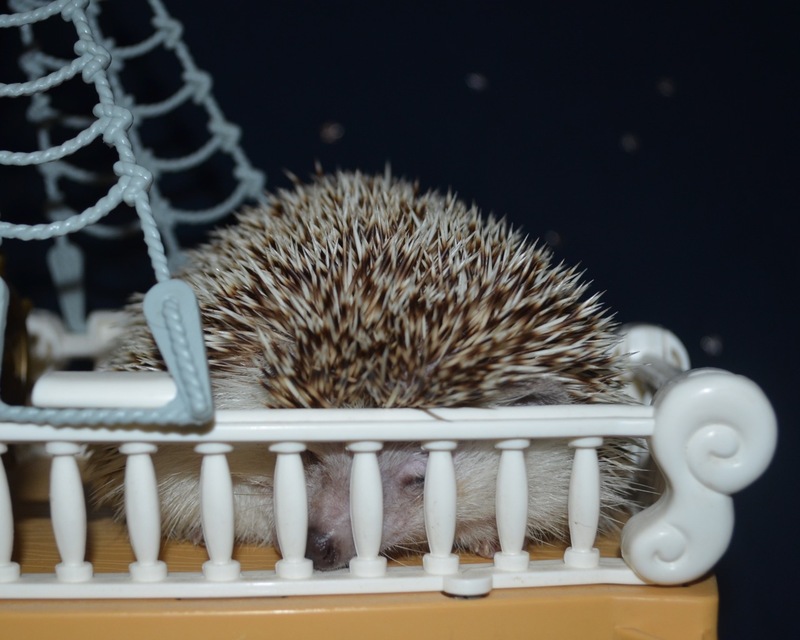 Well as it turns out, it’s really named Pricess Pricklepants and the Perils of Pirate Plunder: The Picky Princess. You may read it now. We have a few points of note to present before beginning our tale that can’t be skipped for reasons involving word count. First, we finally read Quentin’s email. It was a link to a funny cat video. Thank you Quentin. Second, we got slightly better lighting set up, so the photos should be slightly better. 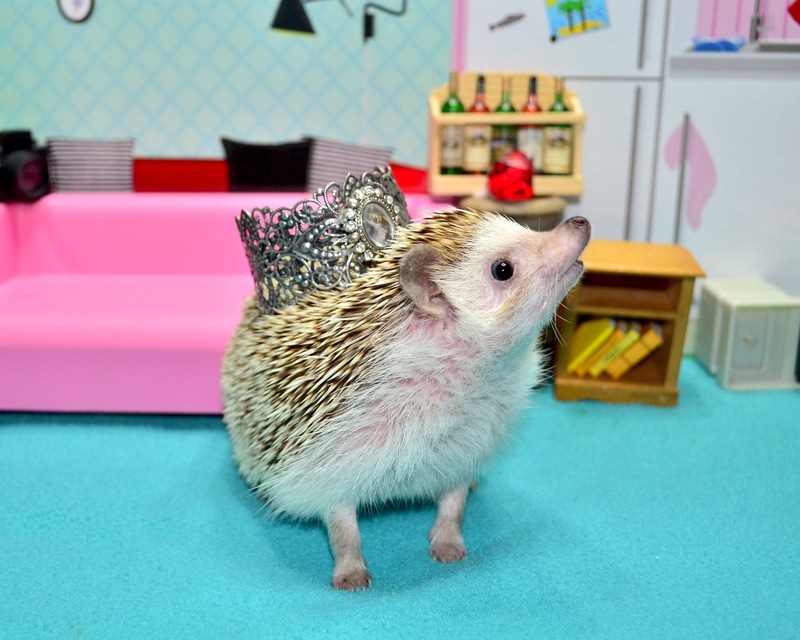 Princess Pricklepants: Princess Penelope Pricklepants, Grand Duchess of Tiggy-Winkle, Defender of Hufflepuff, Empress of Quillonia, and Dominions beyond the Seas. 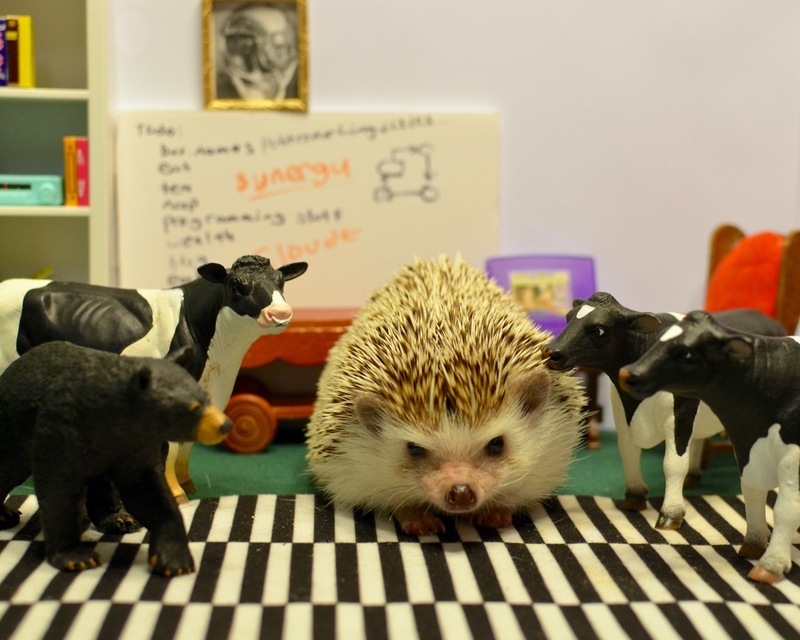 Also, blogger, farmer, space traveler, occasional pirate, and hedgehog of mystery. 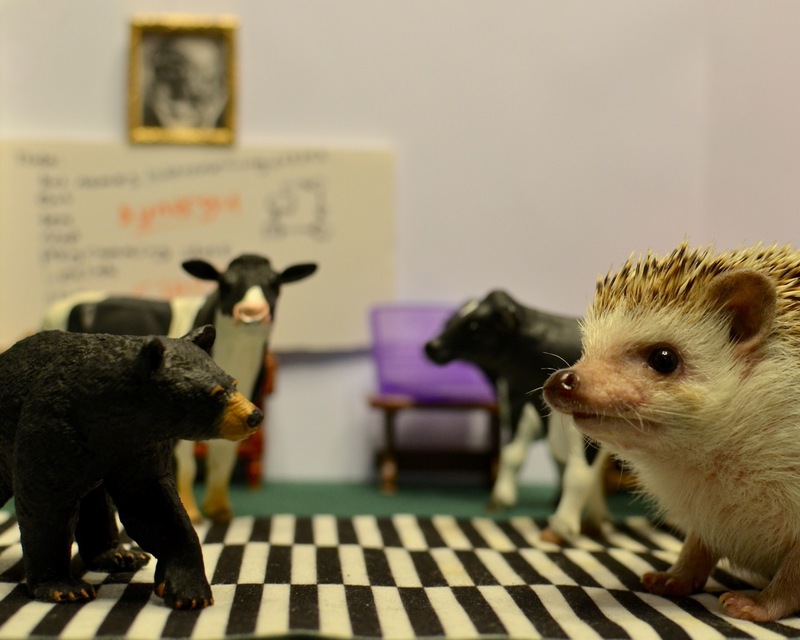 Jane the Cow: Accountant, Chief Financial Officer of Telstar Etiquettronics, their startup. Christine the Cow: Cow safety officer. Boris: Bear, Canadian, Masters in Comparative Mythology from University of Toronto. 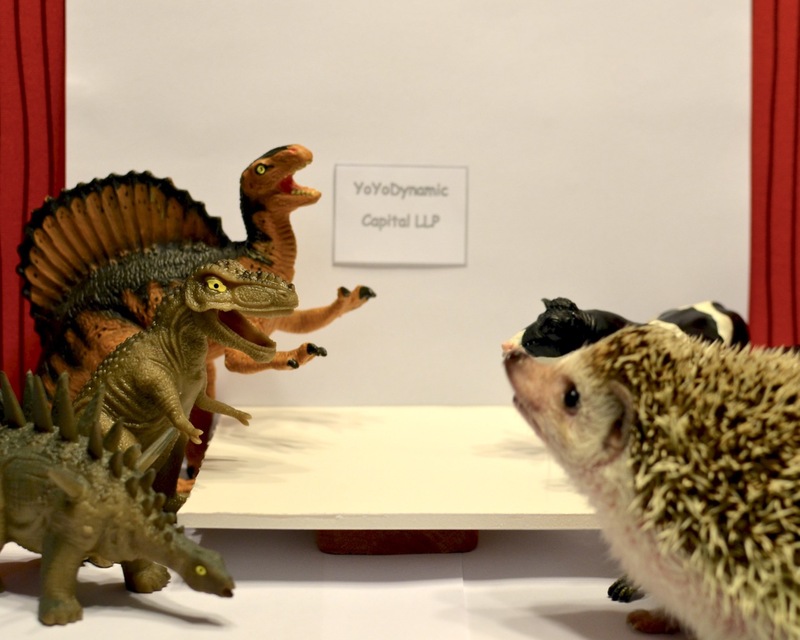 Dinosaurs: Venture Capitalists at Yoyodynamic Capital. Crocodiles: Former farm animals, now crocodiles, or maybe alligators. 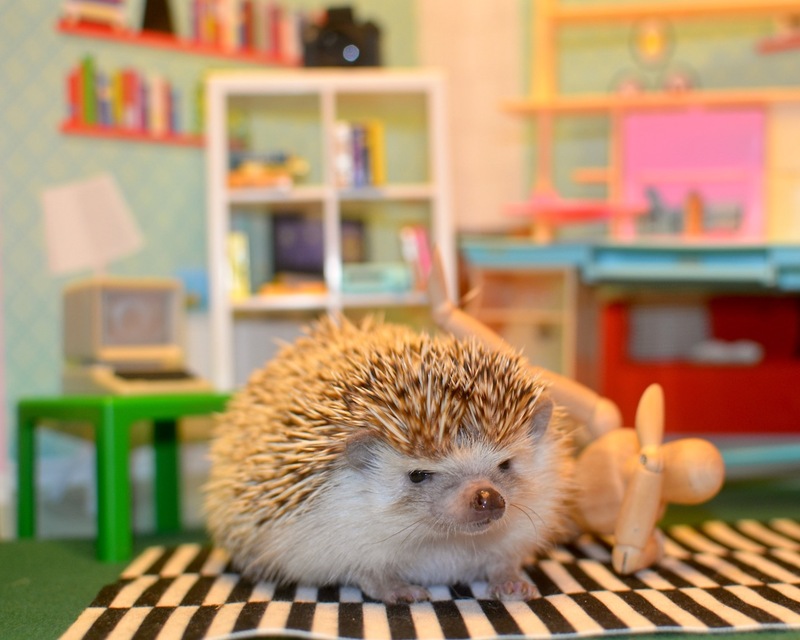 Princess Penelope Pricklepants was distraught. Someone had left her copy of Haley’s 2007 Compete Guide to Etiquette on the floor. She’d been looking for this to reply to an automated etiquette request message for her new startup, Telstar Ettiquettronics. Suddenly her computer made the bleepy sound indicating a Skype call was coming in. It was Jane, the CFO. 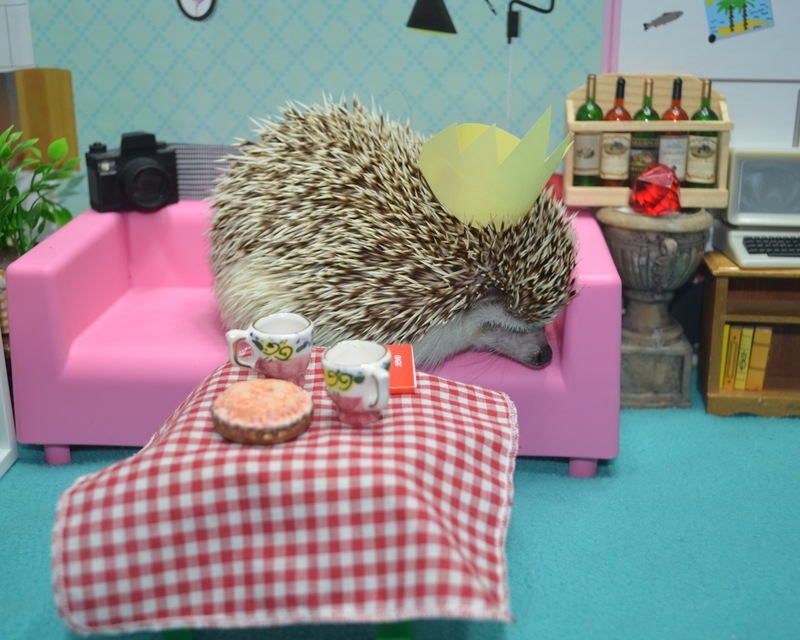 Princess Pricklepants was not in her best mood. She’d only gotten 15 hours of sleep the night before. Someone had left her etiquette guide on the floor. And now this. (Since they’d started working in tech., they had also been practicing starting sentences with conjunctions.) 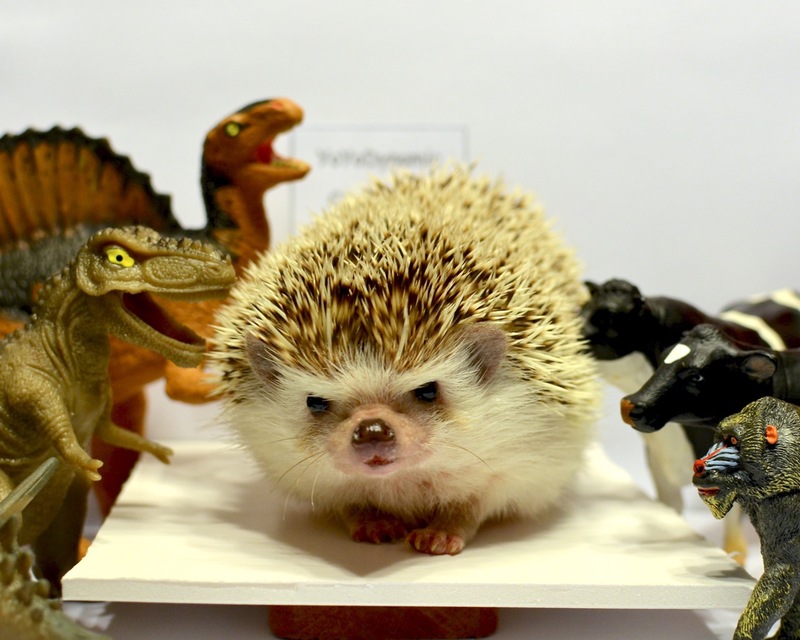 Her company that she’d worked for days to build was now stolen by dinosaur venture capitalists. 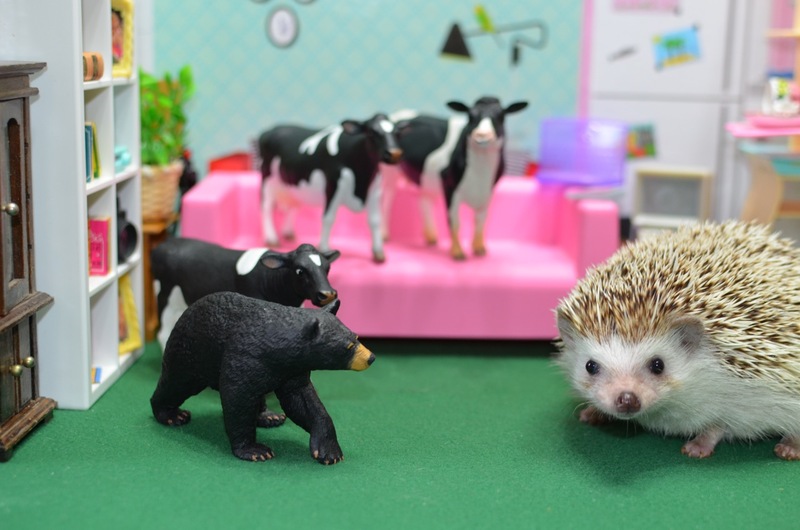 She called a council of the bear and cows. The ayes were over the nos. Princess started typing, “Dear Sugar Mama, while this is a common problem, this is not a…” Boris put his paw over her phone. 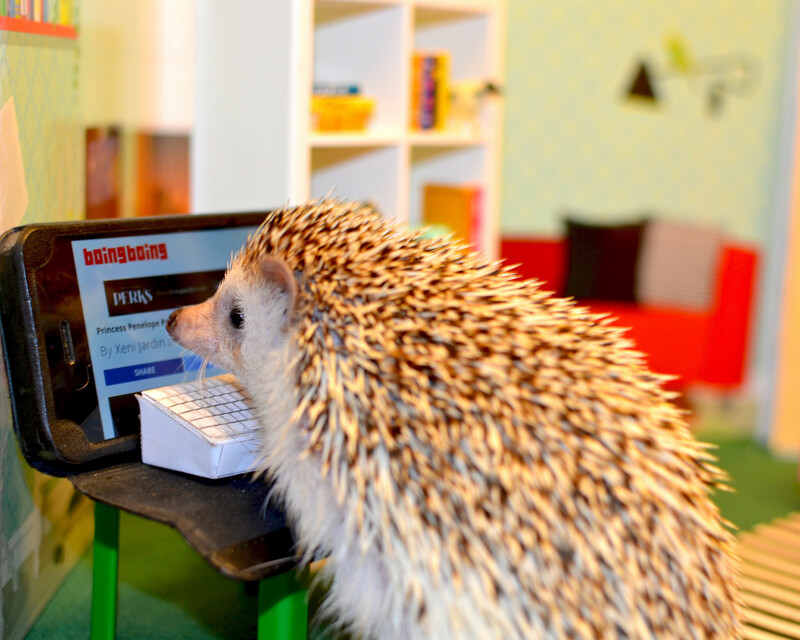 And so it was that our heroes were sad, especially Princess, who didn’t have a phone, but wanted to check what the hedgehogs on hedgehogentrepeneurcentral.com might advise, and also to see if there were any new hedgehog videos on Youtube, and also to look up crocodiles and alligators on wikipedia to sort out something she’d been puzzling over. Princess felt sad, and went to her quiet place to go play with some old toys that the family had passed down through the centuries. Jane followed her. Jane put her numismatic skills to work and determined that the coins were mostly English Guineas from the late 1600s, along with assorted Louis the fourteenth Double Louis d’or, and other gold currency. According to Jane’s careful estimate they were worth a ludicrous amount of money. She began a spreadsheet. 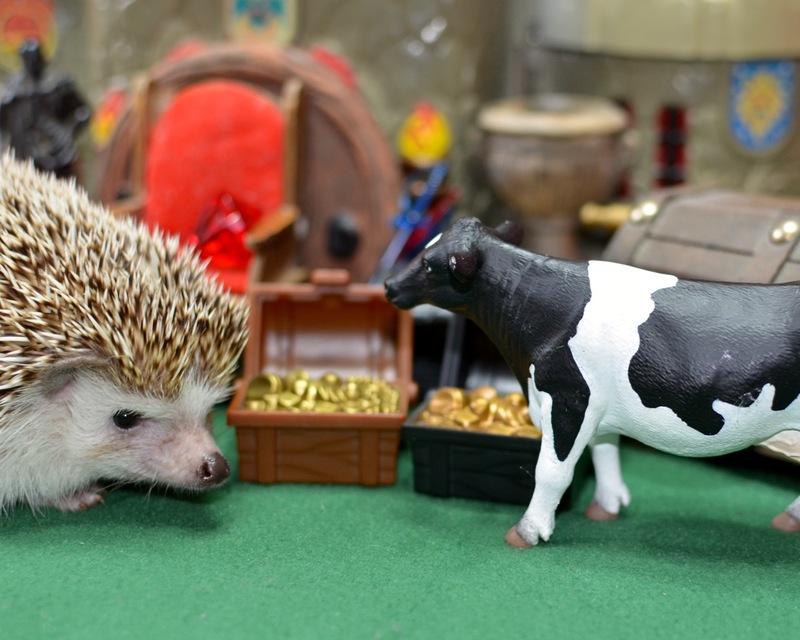 Within a short while they’d managed to get enough rare gold coins sold at auction at Christie’s for enough money that they could skip plots involving hedgehog careers for a long time. 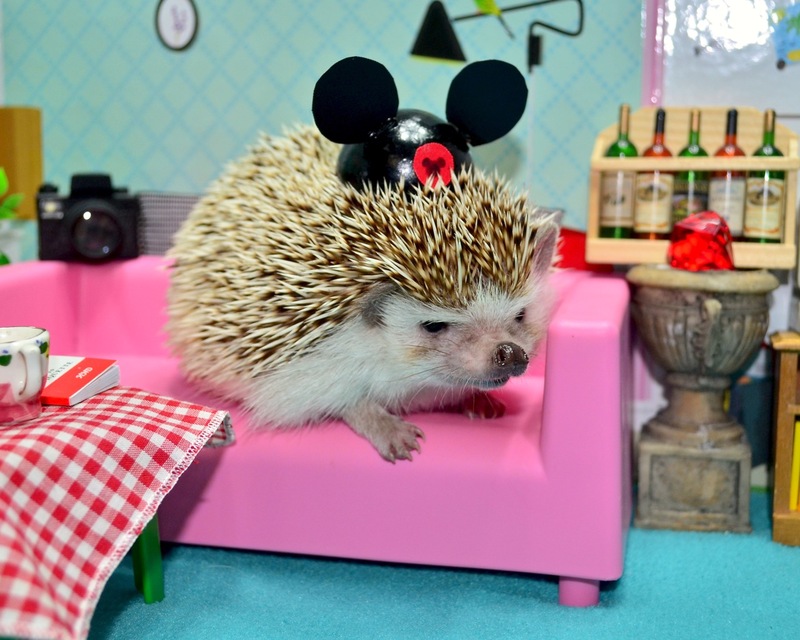 Finally, Princess could pursue her true passion, living life as independently wealthy hedgehog royalty. 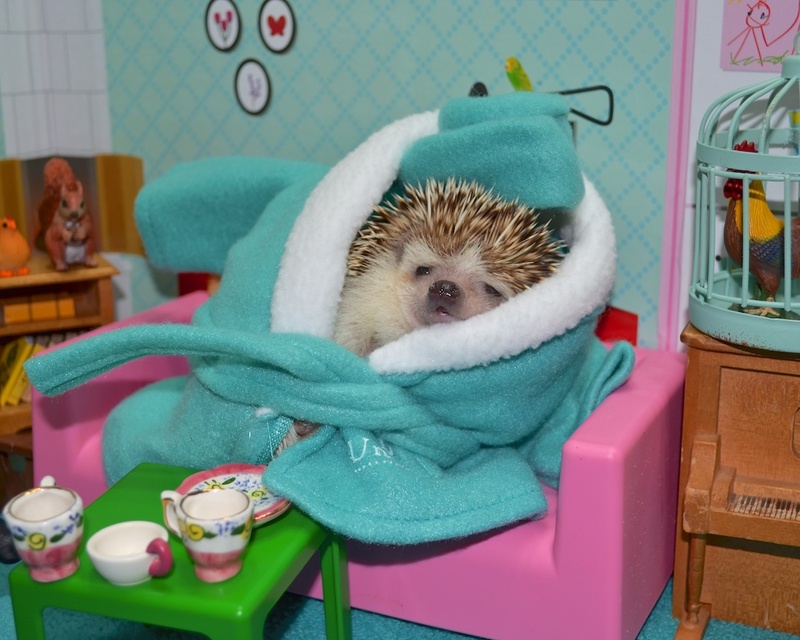 In our next episode, will we begin the Chronicles of Princess Pricklepants? 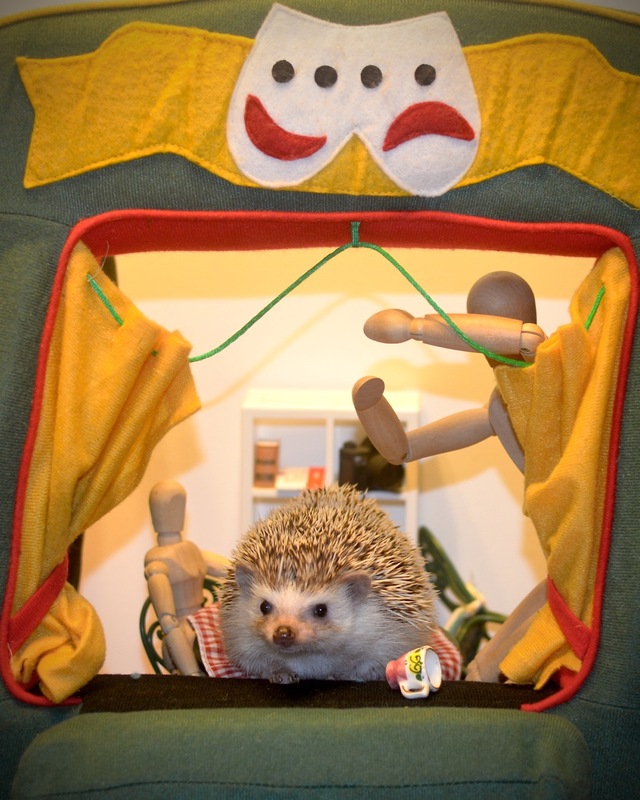 Will we finally get to Princess Pricklepants and the Live Action Role Playing Game? Will we just ramble? Tune in eventually when we finally get to publishing the next episode. Dear reader, we regret to inform you that we haven’t got any proper introduction to this, our latest post, nor any apologies to offer, nor any reader letters to review, nor other things like that which fill up space at the top of a post that are easy to use as filler to help avoid going and writing the other parts of the story that involve more work, and thinking, and coming up with ideas, and setup to do. Rather we are going to immediately jump into this tale, with no delays, rambling, digressions, or other peripheral delays. And here we are… Jumping right in. Oddly, while it feels unsettlingly like somehow that isn’t happening, clearly this is an illusion. Probably it’s to do with Quentin, who had recently written in to say something, though we can’t remember what. As a break from the usual format, we’re also going to not start with a picture, but instead start with words and then a picture, and then words under that picture. 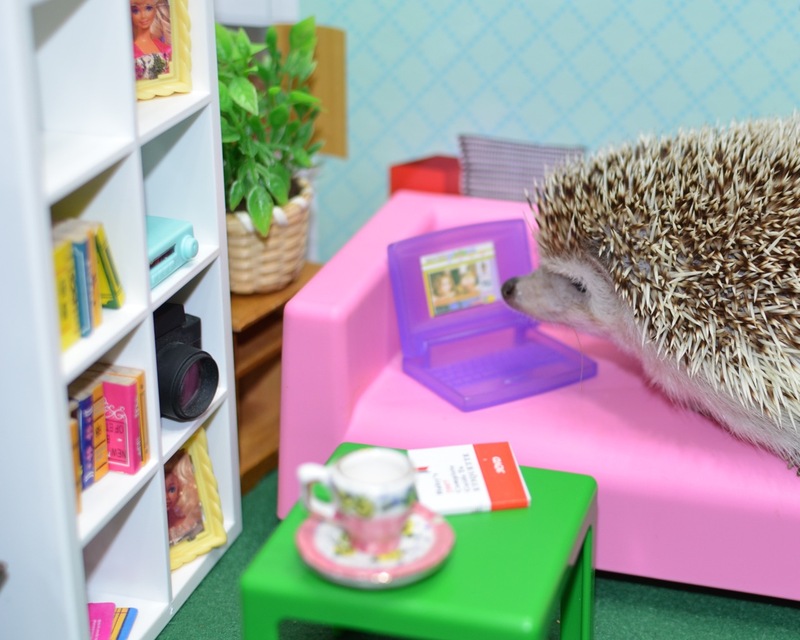 Princess Pricklepants had given up the farming life, and was preparing to retire to a life of royal luxury, when Jane, her accountant gave her a call. “These phones, they’re so hard to dial with hooves. Anyway, I was calling to tell you that the farm wound up eating a surprising amount of capital, to the point that it’s a plot device requiring you to find some form of livelihood.” Princess wasn’t sure what that meant, but assumed it was good news. Jane went on, “You have to find a job.” Maybe not great news. The lack of a photo above the dialogue was moderately unsettling to Princess, somehow, adding to her sense of unease. But Princess, in her inimitable metaphorical style, decided to make lemons out of lemonade. So, Princess decided to pursue her true passion, acting. Jane noted that this meant that there were going to have to be some lifestyle reductions until they had an income. Princess came up with a brilliant plan. She would play to her core strengths, and pursue her true passion, acupuncture. While it seemed like a great idea, in retrospect, acupuncture was very difficult to make a living at. While she tried to be polite, her patients kept whining. And screaming. No patients ever returned after their first visit, and most refused to pay, even when they seemed much healthier once they had every acupuncture point stabbed artfully (and politely) with her quills. A few sent medical bills to her saying something about blood transfusions. 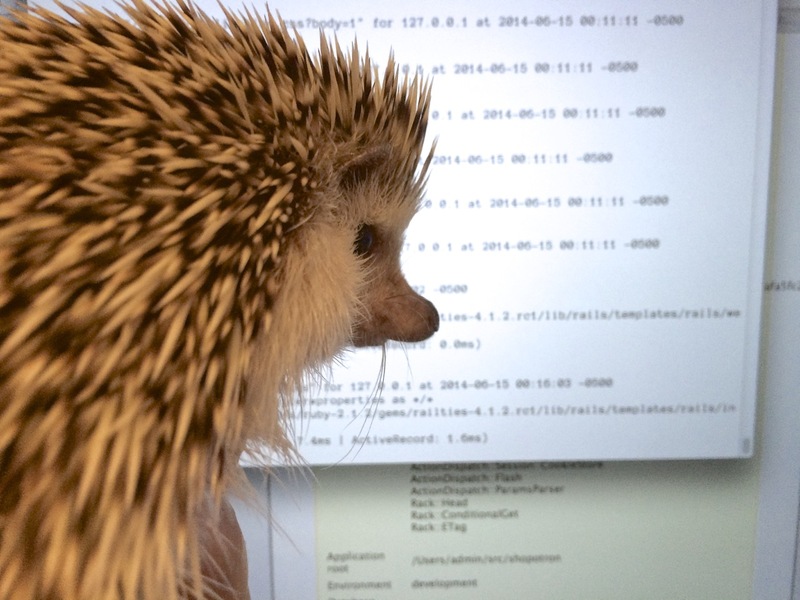 When she checked on hedgehogaccupuncturistcentral.com she was surprised to find many other hedgehogs had similar problems. So she decided to pursue her real passion, photography. 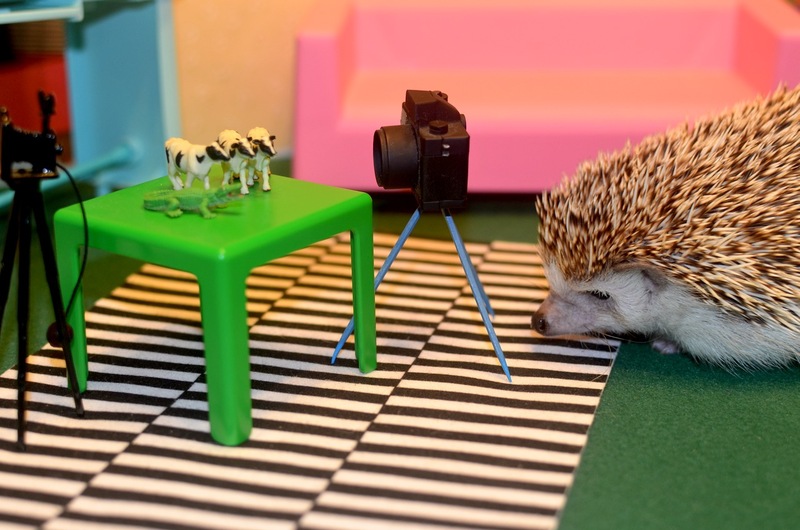 She decided that taking photos of small farm animals on table-top sets had to be the start of a brilliant and lucrative photography career. Strangely, her work never became massively popular in a whirlwind of fame bringing in no cash, prizes, or wonderful adventures as a brilliant and respected photographic artist. 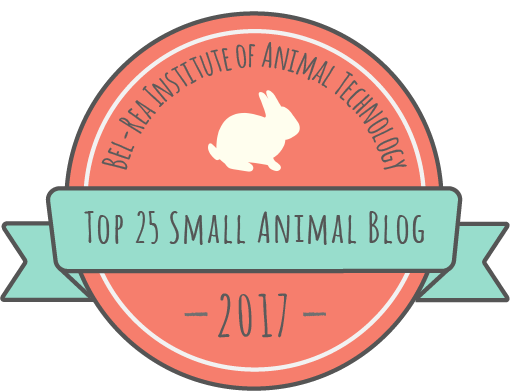 She did get a photo shared on Cute Overload, her favorite blog, but somehow that didn’t bring everlasting fame, but more like twenty views. Perplexing. Clearly that was a ridiculous way to spend her time. So she looked around at what was popular in the Internets and noticed bird photography was very popular. She could still pursue her true passion, photography, by doing a different type of picture-taking. Also, birds were moderately interesting, at least for nerds, so she could use them as a market. Perfect. They buy all kinds of worthless things. At first things were going pretty well. She found a bird, it didn’t fly away, and she took a picture. Then she looked at the blurry picture, poorly composed, and with terrible light, and determined that she’d need to find another bird. This was tedious. 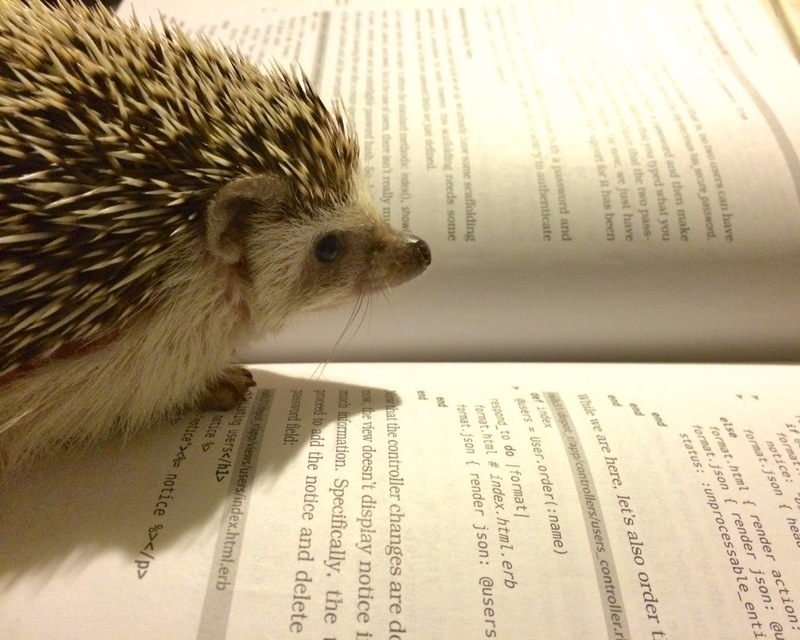 She also realized that while she could pursue this course for a very long time, enough to fill a few blog posts full of Princess Pricklepants, Bird Photographer, this would be very dull for the poor readers. Also, her blurry duck photo was rejected by National Geographic. So she decided not pursue this as a career. What was left? 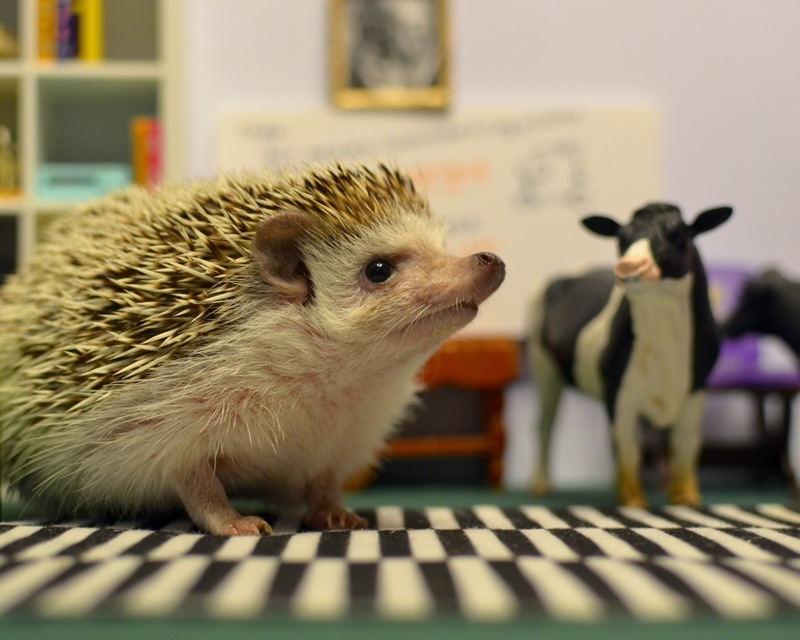 She had so many skills, advice columnist, farmer, warrior, space traveler, but none of those things were a proper job fitting a hedgehog of noble bearing, regal poise, and impeccable politeness. This was slow and dull, so she began a montage with 80s music to make it go faster. Yet, the post was already too long even with this career-related activity compressed into a peppy compressed series of images edited into a sequence to condense space and time illustrating her hard work. Also when she put in her resume, all her applications as a programmer and systems analyst were rejected by the companies she applied to. 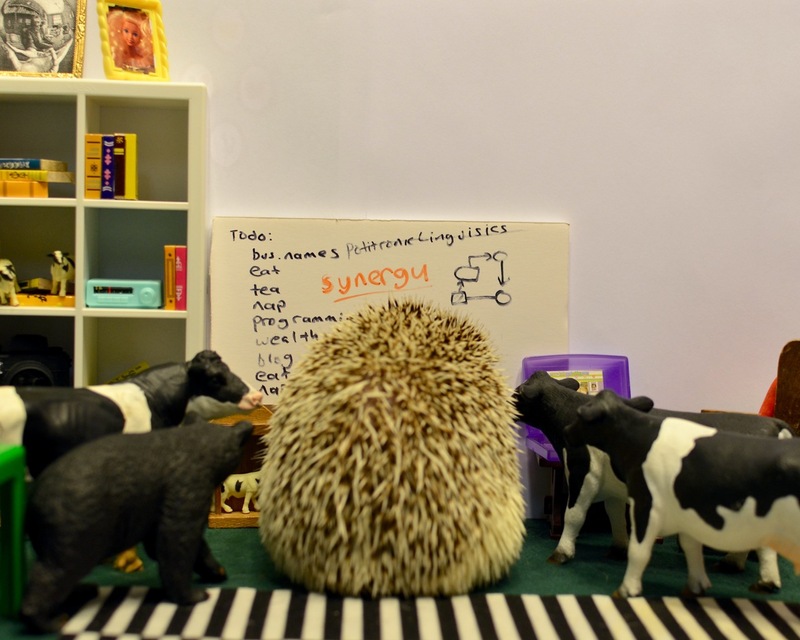 They said things about degrees, and prior experience, but it was clear that they were hiding the truth – another sinister side of the Perils of Pet Prejudice. 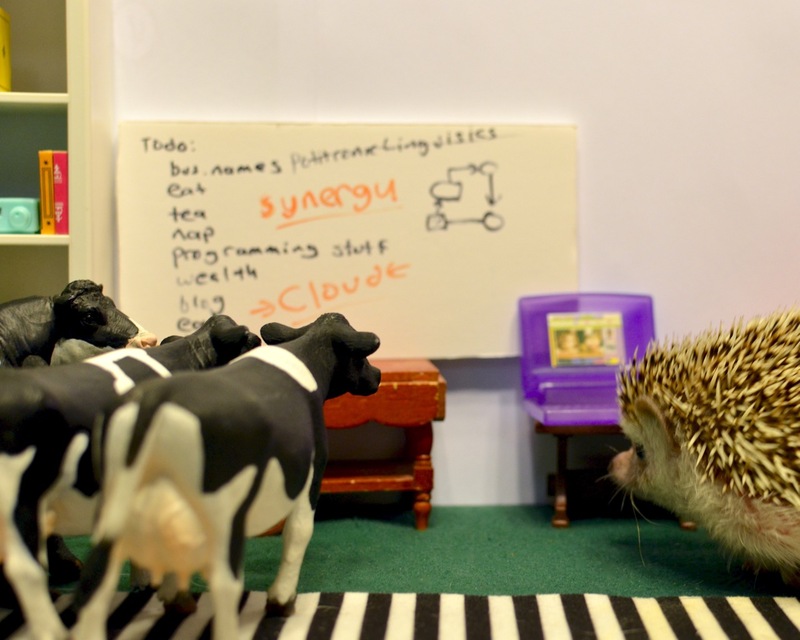 And so she decided that next episode she would pursue her real passion, doing a web startup. But that is something to tell about another time, since we’re close to 1000 words, which is how long these things typically go. So, for now, adieu. 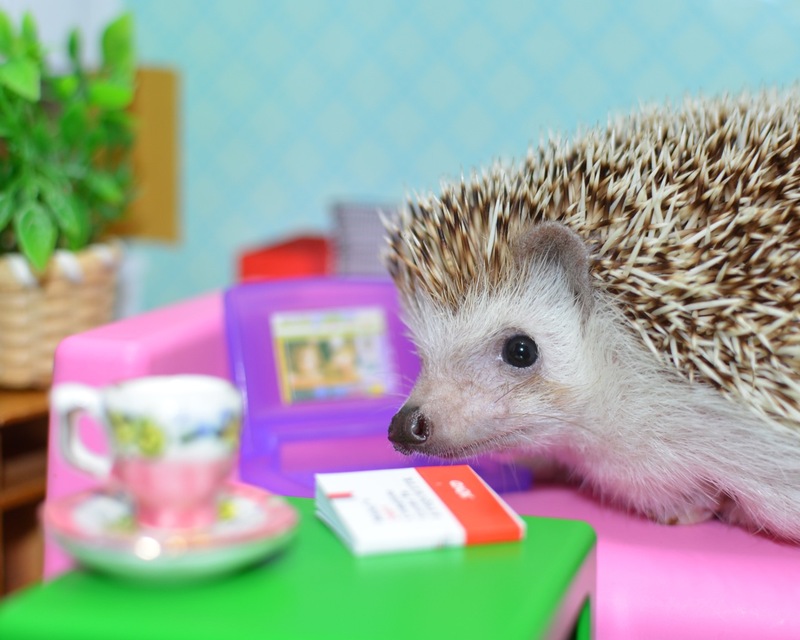 And soon, Princess Pricklepants, Startup Founder might appear. Or maybe not soon. 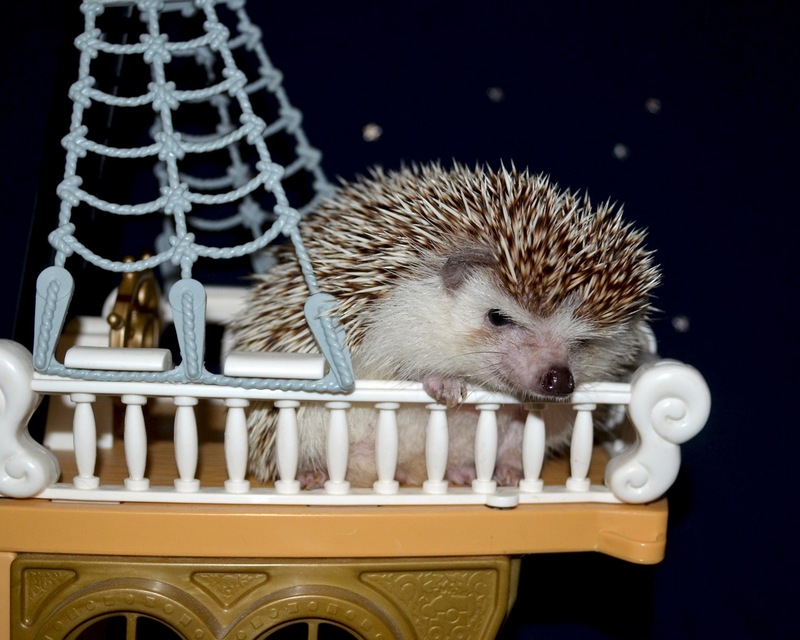 Given the way these things go, we might wind up with Princess Pricklepants Pirate Adventurer in a few months. 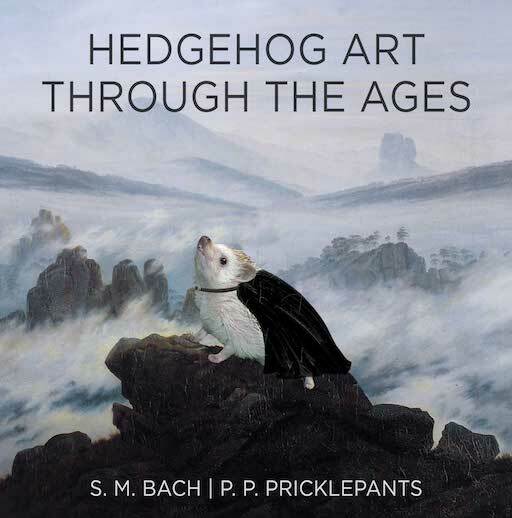 Or maybe, Princess Pricklepants, Bird Photographer, because we’d really like to do that even if it’d be dull and tedious for everyone but us. Sorry, we like taking bird photos, even though it is definitely not a profitable venture.